Rob Zierenberg writes: The number for today seems to be 33—the current wind speed in knots. Waves are pounding into the ship and we cannot launch the ROV in this weather. 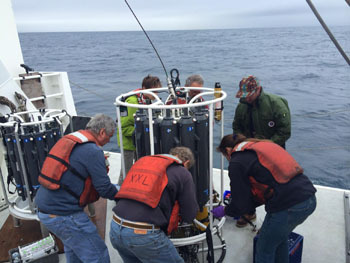 Everyone was really looking forward to today’s dive, which was in Pescadero Basin, the next spreading segment north of the Alarcón Rise. The plates are diverging here at the same rate as the Alarcón Rise, but there is less volcanic activity. The result is that the spreading center is much deeper, more than 3,800 meters deep compared to 2,200–2,400 meters for the Alarcón Rise. Pescadero Basin is also closer to land and is filled with at least several hundred meters of sediment. It wasn’t certain that we would be able to find any volcanic rocks exposed on the seafloor due to the sediment cover. Why, then, was everyone so excited about this dive? Before this leg of the expedition we had the AUV D. Allan B. making detailed maps of the area. The maps show several mounds built above the sediment, some of which are topped by chimneys up to 27 meters tall. The best explanation for these structures is that they are mounds of metal sulfide minerals made by hydrothermal vents. The AUV has a temperature sensor on it, and every time it passed over one cluster of three large mounds it detected a spike in temperature, so we know we have large, active chimneys here but we don’t know how hot they are, what animals live near them, or the chemical composition of the fluids. 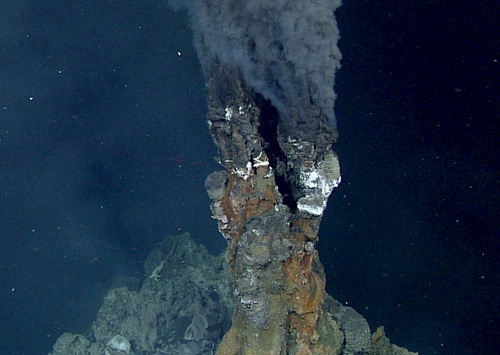 The maximum temperature of hydrothermal vents is limited by the pressure (a function of depth), so in the deep Pescadero Basin, there is the possibility for very hot vents. Hot fluids moving through sediment can also alter the organic matter deposited with the sediment and can form hydrocarbons, which has been observed in the Guaymas Basin to the north of us. 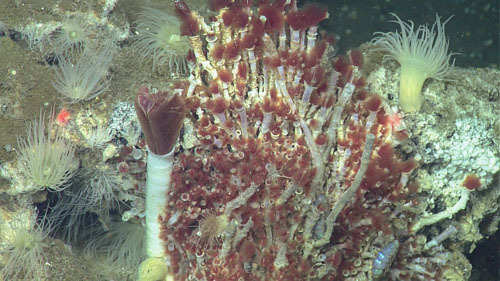 Venting of methane- and hydrocarbon-rich fluids provide even more potential metabolic opportunities for vent organisms, so some of the vent fauna may be different than what we have seen. There are plenty of reasons to be excited about what we might find. My main responsibility on this cruise was to oversee the collection of hydrothermal fluid using specially made titanium sampling bottles. The water samples will be analyzed when we get back to shore. Getting good samples of hydrothermal fluid is not easy. If the water bottles are not assembled correctly, they may not trigger. I admit I was somewhat nervous before the first fluid collection (see the April 7 log). As I sat quietly in the control room contemplating the upcoming dive I realized that the dive number for that day was 743. 743 is a prime number; that can’t be a bad sign! Collecting water from a chimney venting clear shimmering hydrothermal fluids. The nozzle has to be positioned fully into the orifice, but visibility is often poor. 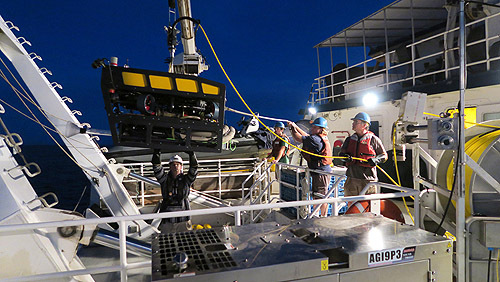 The pilots operate the ROV’s robotic arm nearly 3,700 meters below us while looking at monitors displaying views from several camera angles to accomplish this difficult three-dimensional task. 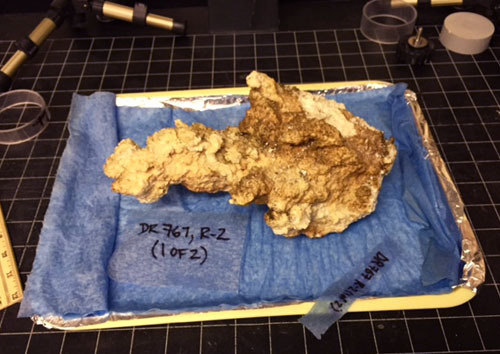 Collecting good hydrothermal fluid samples turns out to be amazingly difficult. The vents are incredibly hot, up to 360 degrees Celsius but also powerfully turbulent. The turbulence causes seawater to mix with the hydrothermal fluid and compromises the sample. Just a few centimeters above the vent opening, the temperature can drop to well below 50 degrees Celsius and the sample collected at that point will have far more seawater than hydrothermal fluid. In order to get a good water sample, the nozzle of the water sampler needs to be inserted straight down into the narrow vent opening, which is not an easy task with the shimmering water and black smoke pouring out of the vent. This would be hard enough if the ROV were parked on the bottom, but the active vents are often well off bottom on narrow and unstable chimneys, and there are severe consequences to putting the ROV in the wrong place. If there is a hydrothermal vent underneath the vehicle, outside the camera’s view, the heat can easily burn through the hydraulic or electrical equipment, putting an abrupt end to the entire dive program. 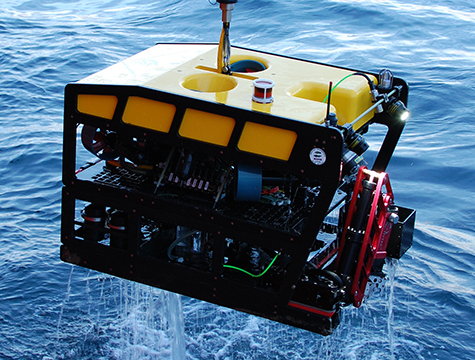 The ROV is connected to the ship by a cable that transmits power and data. If that cable is dragged through a chimney field, the ROV could be lost. 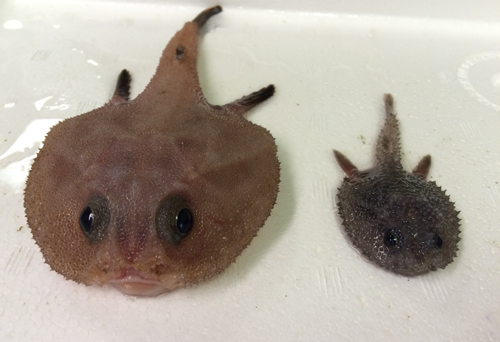 So while I was nervous about getting good water samples, it is really the ROV pilots who had to do the hard work. If you have been reading these cruise reports, you will already know the pilots aboard the Western Flyer are good. Getting good vent fluid samples in a vent field with clusters of closely spaced chimneys up to 30 meters tall takes a coordinated team effort with good communication between the scientists, pilots, and the ship’s crew, and a careful, patient approach. I have been incredibly impressed by the professionalism and dedication of the team on the Western Flyer. 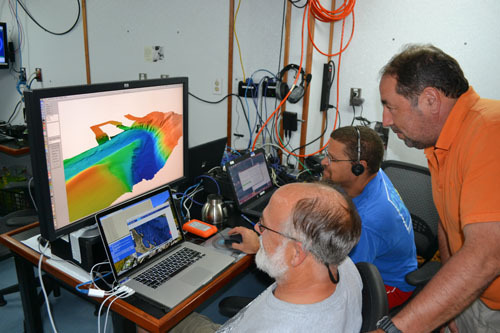 Dive 743 did indeed turn out to be a prime dive, and we now have great vent-fluid samples from Meyibó vent field. I had hoped 4/12 would also be a good number; it’s my birthday. You don’t always get the present you want for your birthday, but I can honestly say that I am thankful for the opportunity to participate in this cruise; it is indeed a privilege to be able to work with personnel and research capabilities of a top-notch research institution such as MBARI. My post above was written just after breakfast with the assumption that we would soon be headed into port having cancelled the last dive due to weather. 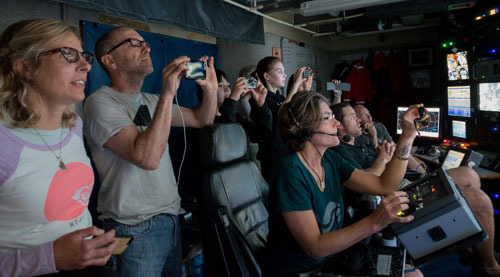 We had a limited time window where we could wait for the weather to calm down and launch the ROV. At the water depth of this site, nearly 3,700 meters, it takes two hours to get to the bottom and two hours back. If we were going to have just two hours on the bottom to sample vents, that’s a pretty short time for such a difficult task. The winds died down about as fast as they came up, and at literally the last hour, we launched the ROV and headed to the bottom. Maybe 4/12 was not such a bad number after all. What we saw was different from all our other vent fields. You’ll read about it in upcoming logs for the Vents and Seeps biology leg, but we now have 290 degrees Celsius clear hydrothermal vent fluid and mainly carbonate chimney samples. Sampling these vents was not trivial. Again, I am amazed by the skill of the ROV pilots. The Western Flyer and Doc Ricketts crew members are the heroes of today’s dive and I am the grateful recipient of the gifts from the seafloor. So thanks to all aboard the Western Flyer, thank you MBARI and the Packard Foundation, and happy birthday to me! The sample drawer of the ROV Doc Ricketts is filled with hot-water sampling bottles used on this dive. Spires of delicate orifices venting clear shimmering hydrothermal vent fluids on a six-meter-tall chimney in the Pescadero Basin. The red laser dots are 29 centimeters apart for scale.